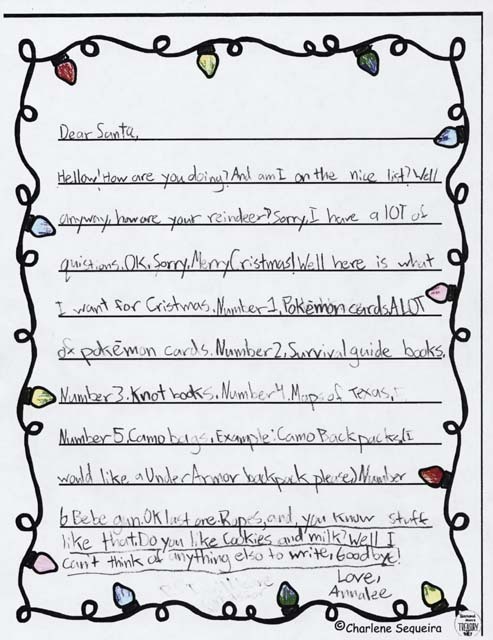 Every year Salado Village publishes Letters to Santa Claus written by the third graders at Thomas Arnold Elementary. This year, we have produced the actual letters into a slideshow for you to enjoy. 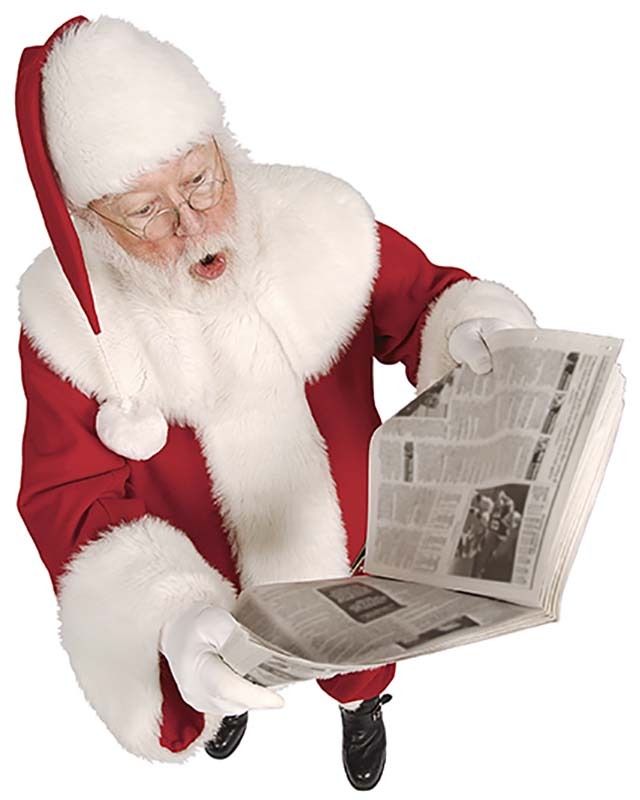 Pick up the print edition for the Letters to save for your scrapbook! Im so excited for Christmas. I will make you some treats and give you a nice cold drink. Hope you have a great time delivering presents. I was wondiring if you could bring me some big bottle of Elmers glue and some things for my dog’s? Can I get some puzzle. 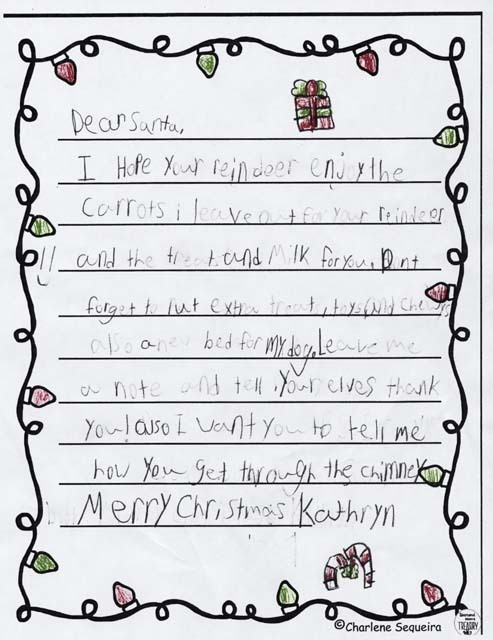 I will leave carrots for your reindeer. I’m excited for CHristmas. 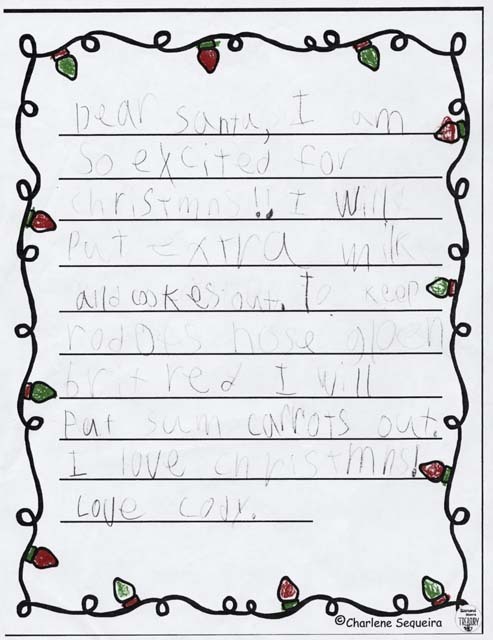 I going to put a lot’s of cookies and milk I’ll put carrots that lead to my house so your reindeer’s can eat the carrots. 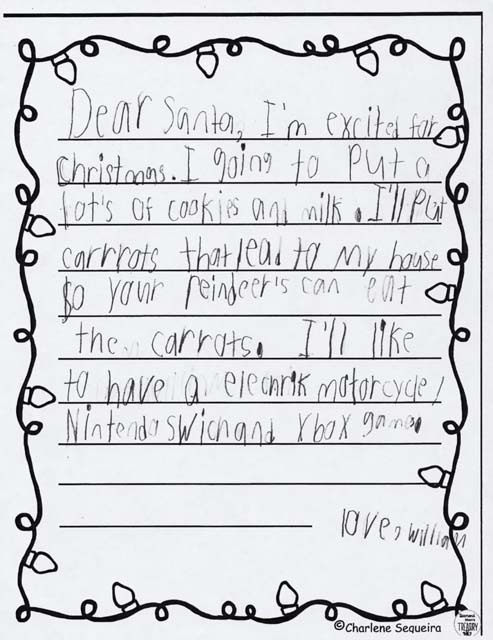 I’ll like to have a elecrrik motocycle/Nintendo Swich and Xbox games. I am going to get you cookies and milk, or if you have been loving your mexacan cakes I can get you that to. It would be relly nice for you to bring me a bike, zipline, computer or a fitbite. I would relly want a computer or a bike. But mostly a computer. 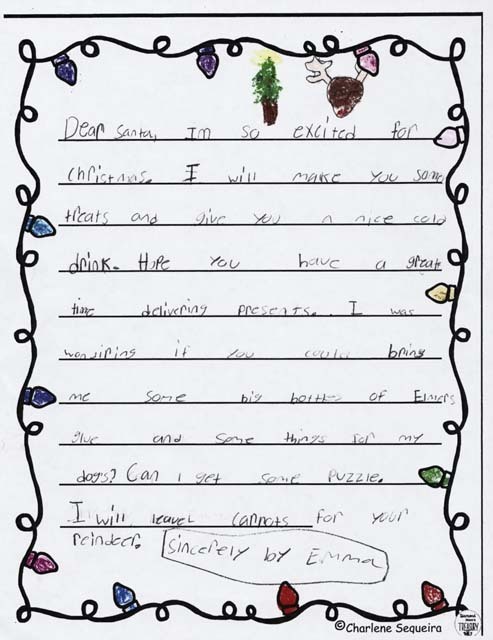 Thank you for delivering us relly cool presents and make sure to find carrots on the grass and watch our for are chrismas lights. merry christmas. p.s. 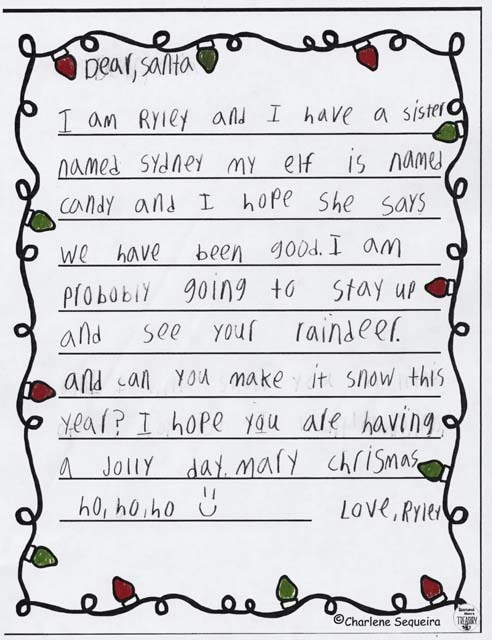 tell are elf to bring us candy canes. I am so excited for Christmns!! I will put extra milk and cookes out. To keep rodofs hose gloen brit red I will put sum carrots out. I love Chrismns!! I have been thanking and I’m going to ask my dad if I can leave out carrots. Also I know it makes you sad sometimes when people say thet you are not real. but don’t be sad because I believe in you. Also there is just one thang I want a kitten! 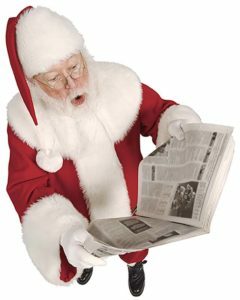 have a merry Christmas and I want a phone and I want you to have a merry Christmas. and I want you to help my mom and my dad and I want a toy and dino toys I know I am 9 years old but I still play with toys and I want a gini pig. how is your year going are you redey for Chrismas. Well I am and for Chrismas I want a new eltric scooter. and hoverboard, and a dron, and a iPod, and a screen pectecter for the iPod. pleas if i am good will you get me them how about this it leav you ten cookis and milk wil you do it???? Merry Chrismas. Hellow! How are you doing? 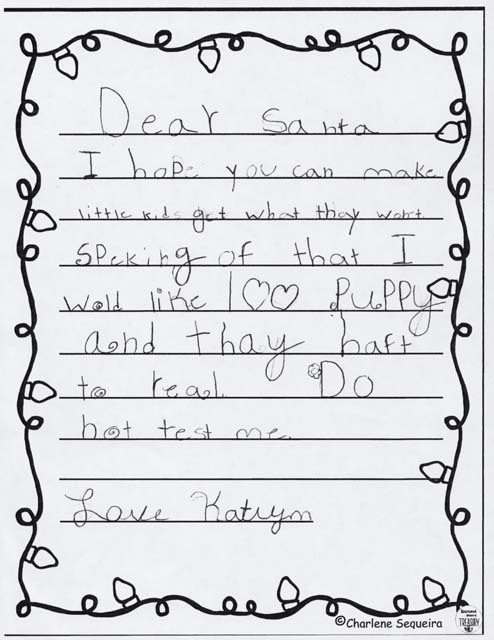 And am I on the nice list? 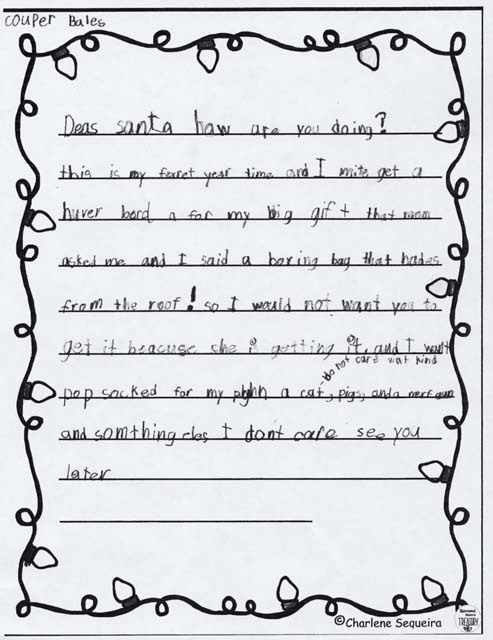 Well anyways, how are your reindeer? Sorry, I have a LOT of quistions. OK. Sorry. Merry Cristmas! Well here is what I want for Cristmas. Number 1, Pokémon cards A LOT of Pokémon cards. Number 2, Survival guide books. Numer 3, Knot books. 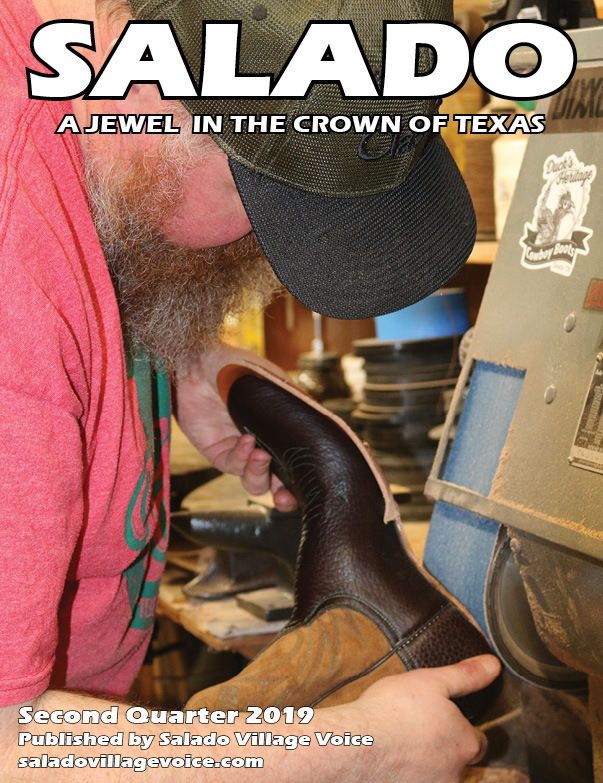 number 4, Maps of Texas, Number 5. Camo bags, Example: Camo Backpack. I would like a Under Armor backpack please. Number 6 Bebe gun. OK last one. Ropes, and you know, stuff like that. Do you like cookies and milk? Well I can’t think of anything elso to write, good bye! Hi how aer you doing today?I want for Christmas a drone and a Nerfgun and a hover board and a Nintendo And a Xbox One. And a new gocart. And a TV. And a remote control truck. Merry Christmas. I am so excited for CHristmas. 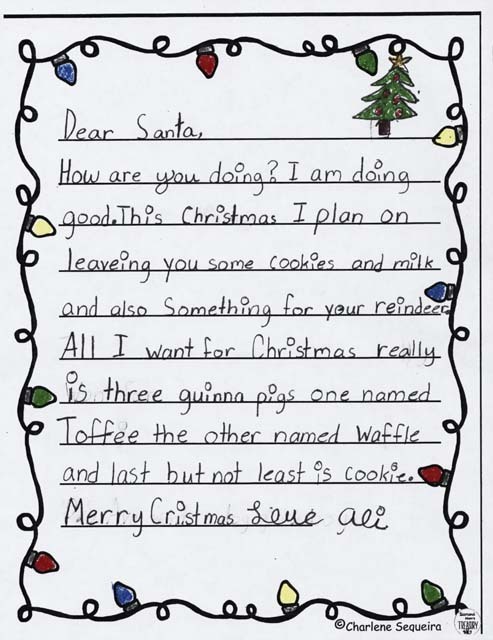 I will leavyou chocolet cookies for you, I love CHristmas I will leav your reindeer some carrots. What i want for Christmas is 3 nerf guns and a coupl video gamse. I hope that you get lot’s of cookies and mulk uring christmas. I hope rhat I get a hover board and maybye a Nintendo Switch with the new pokemon game! 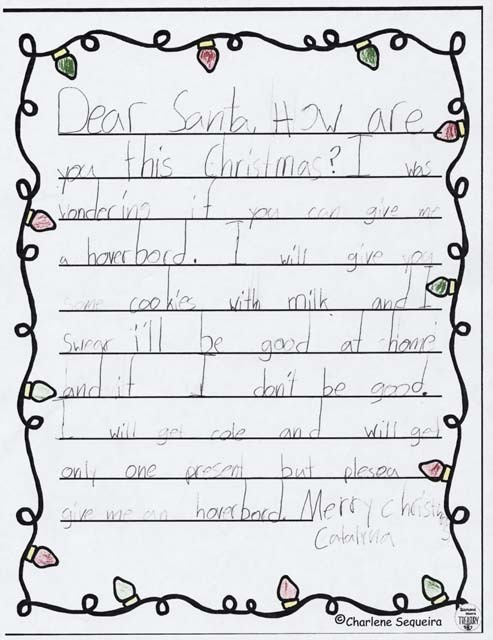 I’ll make sure that I give you lost of extra cookies and milk and carrots for your reindeer. My family also makes a special reindeer food. Merry CHristmas. 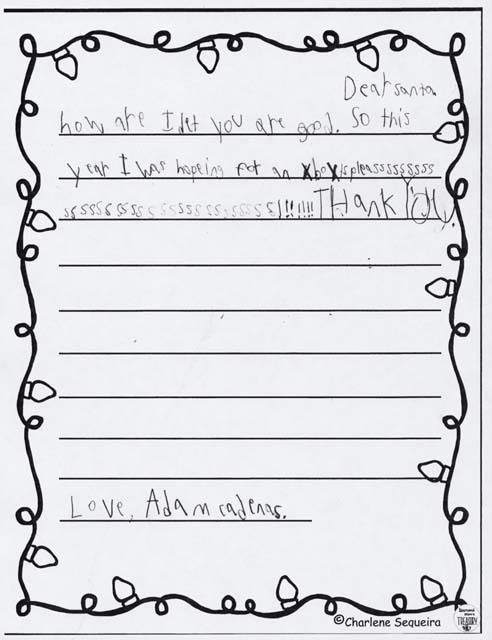 PS this was mailed a week before thanksgiving. 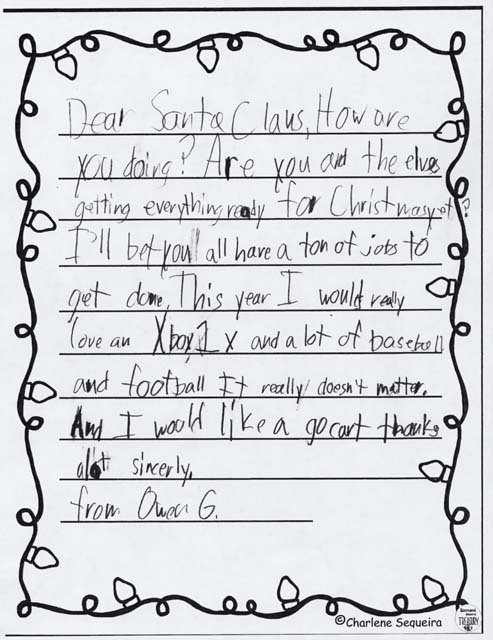 What I would like for Christmas is a magic 8 ball. A LOL surprise mega dolly. A beanie boo owl, A new doll, And a new pair of sparkly shoes. How are you doing? 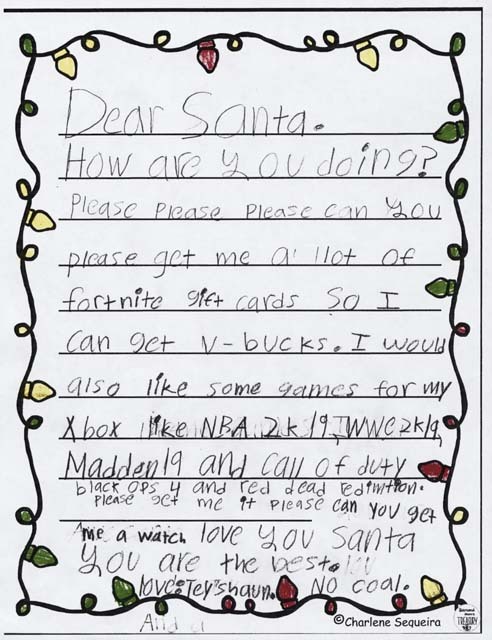 Please please please can you please get me a lot of fortnight gift cards so I can get v-bucks. I would also like some games for my Xbox like NBA 2k19, WWE 2k19, Madden 19 and Call of duty black Ops 4 and red dead redimtion. please get me it please can you get me a watch. 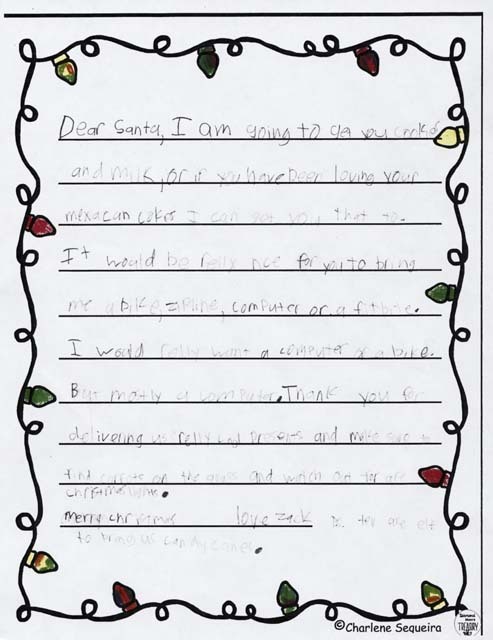 love you santa you are the best. 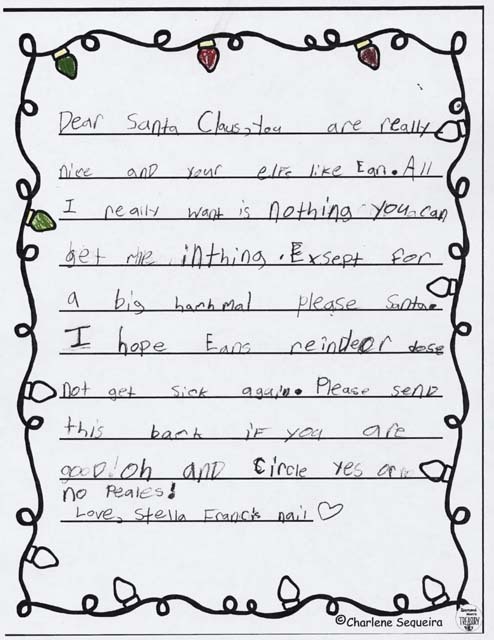 No coal. 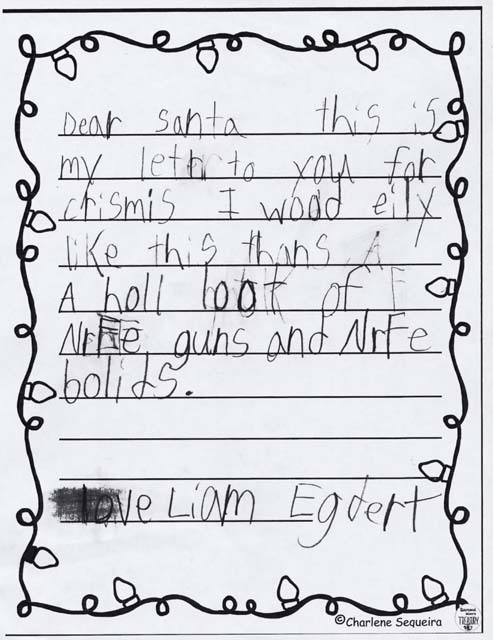 this is my letter to you for crismis I woud eily like this thans a holl hook of Nref guns and Nrfe bolids. how are you doing? Are you getting all of the presents ready for chChristmas? 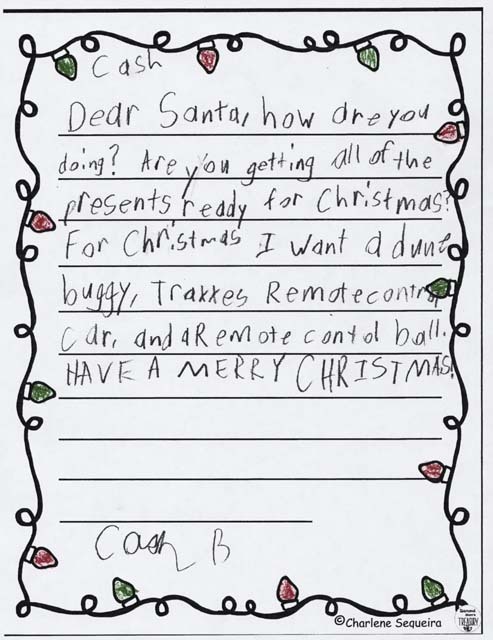 For CHristmas I want a dune buggy, Traxxes Remote control car, and a remote control ball. HAVE A MERRY CHRISTMAS! are you good I hope you feel fin. Your elves are going to be bese. 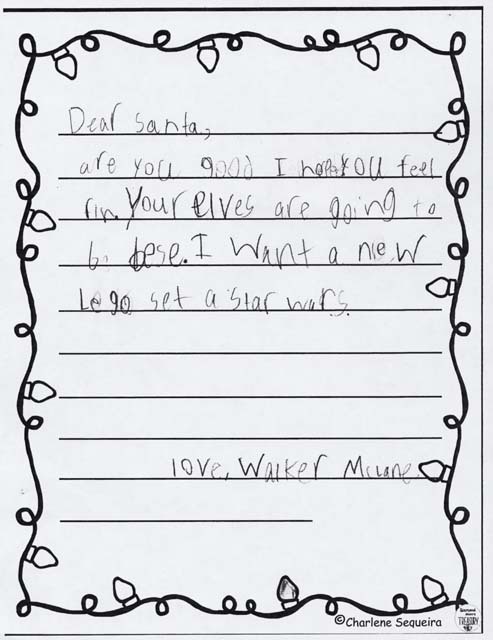 I want a new Lego set a Star Wars. How are you going? Are you and your frans getting every thing ready for crismas. I bet you have lot’s of job’s to get done. 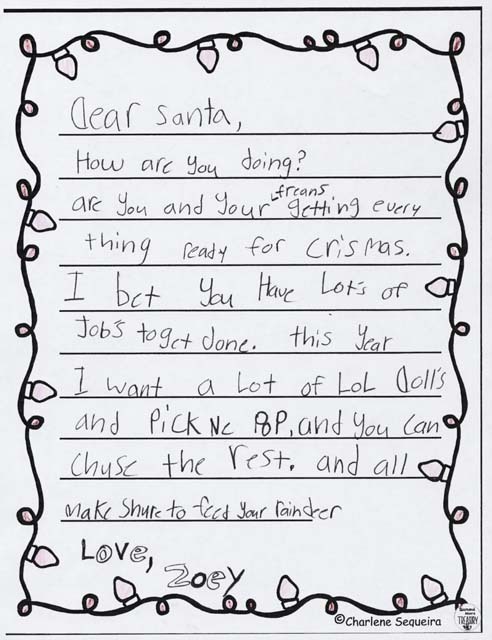 this year I want a lot f LoL Doll’s and pickne oP, and you can chuse the rest. and all make shure to feed your raindeer. How is it going? I love CHristmas because you give the best presents. 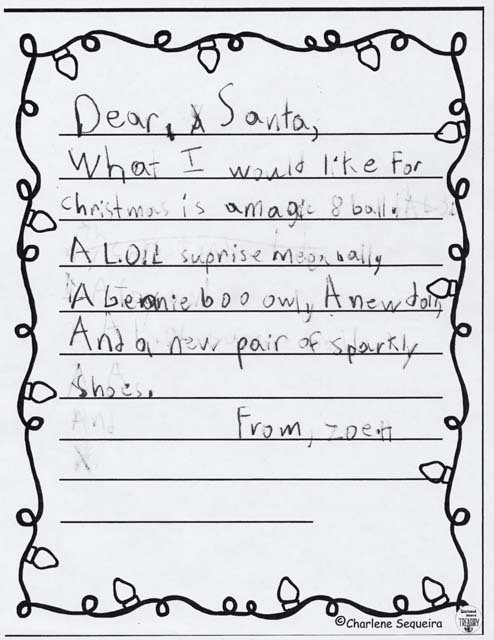 It must be hard to make presents for all the kids and dilliver the presents, For CHristmas I want a surprise. I don’t care what you bring me. I’ll just be happy. 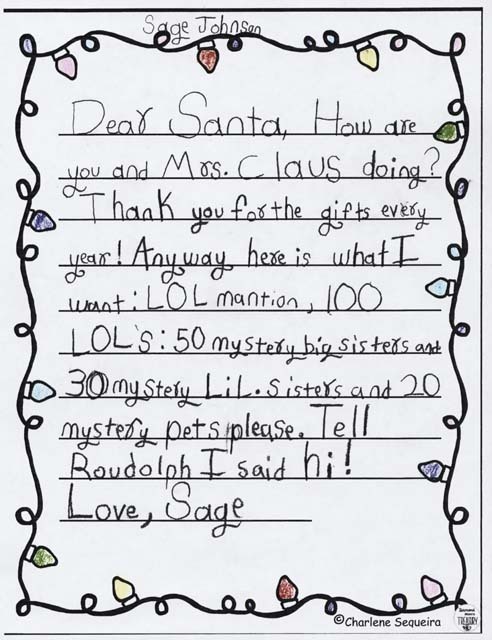 how is Prance and Mrs. Claus? 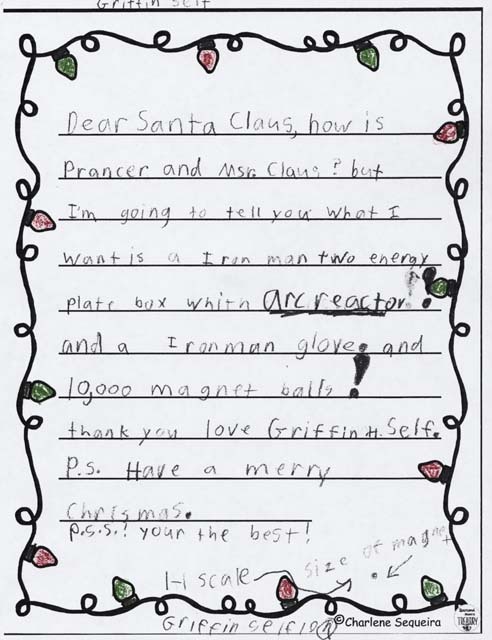 but I’m going to tell you what I want is a Iron man two energy plate box with arc reactor!! and a Ironman glove. and 10,000 magnet balls! thank you. p.s. Have a merry Chrismas. p.s.s. your the best! How are you and Mrs Claus? This year I think I was really good! 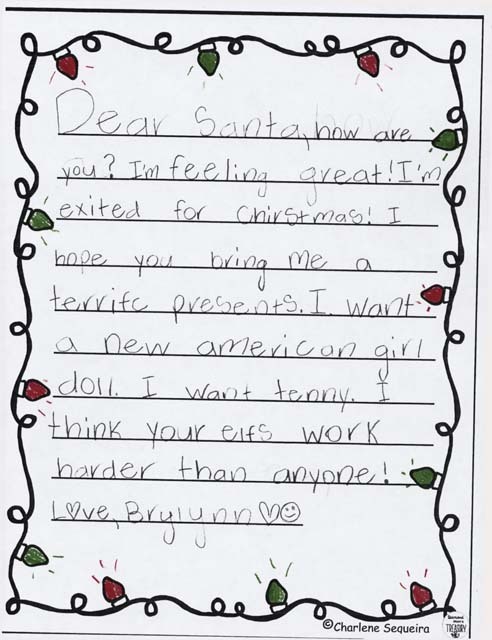 For chrismas I would like a american girl soll! And a new watch! 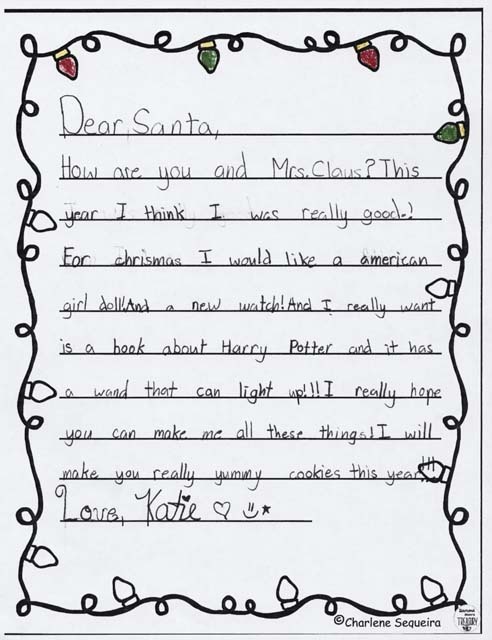 And I really want is a book about Harry Potter and it has a wand that can light up!!! I really hope you can make me all these things! I will make you really yummy cookies this year!!! You are really nice and your elfs like Ean. All I really ant is nothing you can get me inthing. 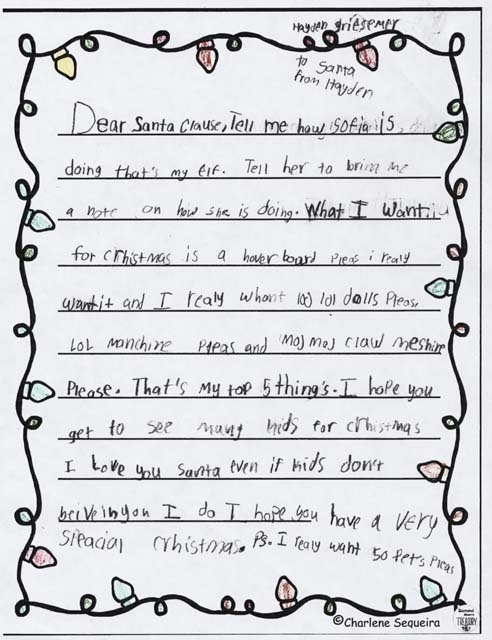 Exsept for a big hamhmal please santa. I hope Eans reindear dose not get sick again. Please send this back if you are good! how are I let you are good. So this year I was hopeing for an Xbox 1 pleassssssssssssssssssssssssssssssss!!!!!!! THANK YOU! How are you and Mrs. CLaus doing? Thank you for the gifts every year! ANyways here is what I want: LOL mantion 100 LOL’s: 50 mystery big sisters and 30 mystery LiL sisters and 20 mystery pets please. Tell Roudolph I said hi! 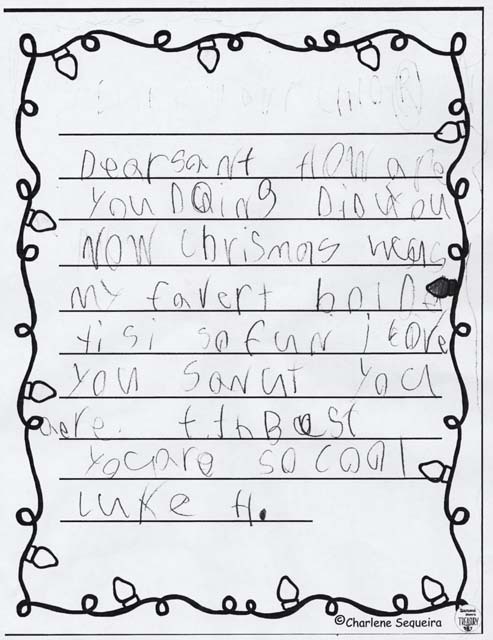 Hi Santa! I just came here to say Hi telling you what I need for crismes. 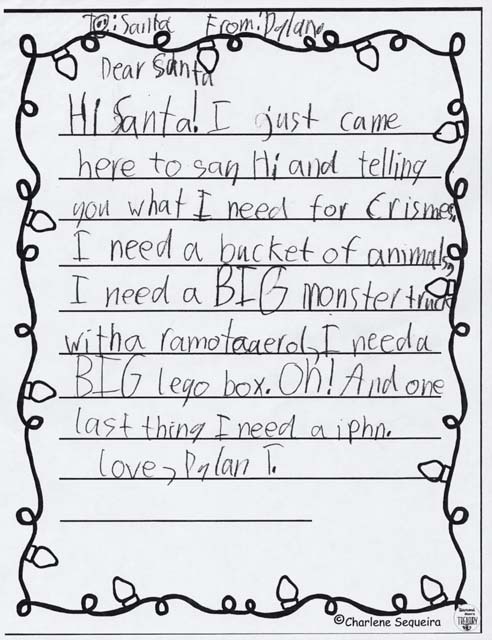 I need a bucket of animals, I need a BIG monster truck with a ramotcaerol, I need a BIG lego box! Oh! And one last thing I need a iPhn. how are you? I’m feeling great! I’m exited for Chirsmas! I hope you bring me a terrifc presents. I want a new american girl doll. I wnat tenny. I think your elfs work harder than anyone! 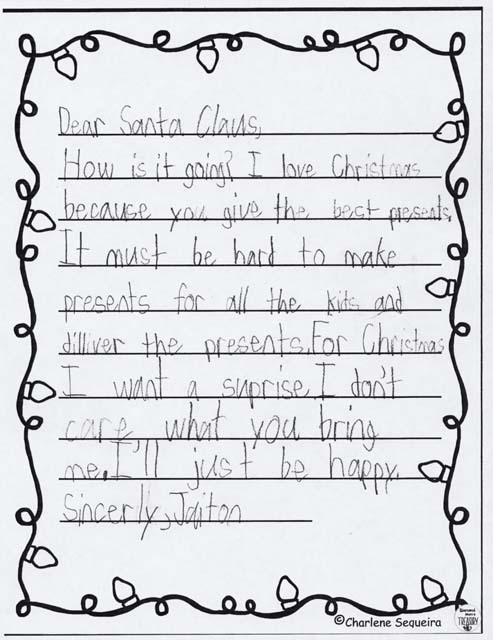 I hope you can make little kids get what they wont. Speing of that I wold like 100 puppy and thay haft to real. Do not test me.